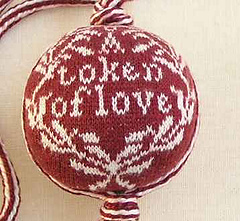 Knit on 6-0 tiny needles with single strands of a 7 strand silk thread this tiny pin cushion reflects those carried by needleworkers in the late 18th and early 19th centuries. This is two color knitting but knit flat in two pieces which are then stuffed and seamed. 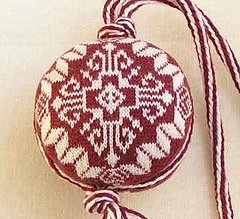 You will also need a length of cord to hide the seam and provide a handle. Gauge is described as “not critical”.